COME TO HOT DOGS' "ALMOST HEAVEN!" THE ANNUAL WV HOT DOG FESTIVAL! 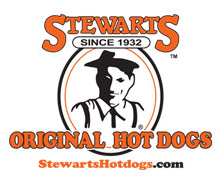 SHOWCASING: Stewarts Original Hot Dogs!.....Frostop Drive-In!......Midway Drive-In!...Sam's Hot Dogs!.....Dave's Famous T&L Hot Dogs of Morgantown......Bianco's Corn Dogs & Treats Galore!...Sheetz!.....Sideline Grille Food Truck!...Kevin and Cathleen's Snack Shack of Hamlin!...Along with.......Carver’s Grille.......Rick's Lemonade!.....ScragglePop!........Village Ice!..........Pullman Square’s Farmer’s Market (open Wednesdays 7a-2p May-October)..................Snowie of Southern Ohio.......... AND MORE! Take a look at last year! All proceeds we raise from the festival's contests, rides, run and activities each year goes to Hoops Family Children's Hospital at Cabell Huntington Hospital, helping the region's children who are in treatment for cancer and other life-threatening illnesses. We hope you find many activities for you, your family, and the family dog to enjoy at the festival again this year! Click here to learn more about Hoops! We sincerely appreciate your donations (any size...together as a community it all adds up to benefit children in our region who needs us!) To donate, simply click the donate button below, and specify the amount you would like to contribute. Please reference WV Hot Dog Festival in the notes of your donation. You will receive a 501c3 receipt for your donation, for your tax file. The Day of the Dog! Need to Contact Us? Click Here! Our Tri-State area is home to an unusually large number of hot dog businesses…many decades-old, family-owned, drive-ins (and other area restaurants with hot dogs proudly listed on their menus too) that shine as beloved, true traditions to us and to visitors from all over the world! We celebrate this unique part of our region…and happily showcase them at our annual WV Hot Dog Festival! 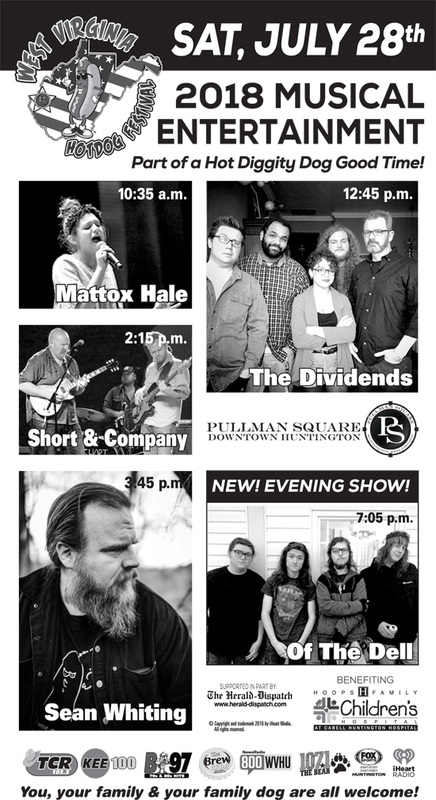 We invite you to come to downtown Huntington, WV (recently voted AMERICA'S BEST COMMUNITY! ), on the last Saturday in July each year, as we collect a dozen of the area's top hot dog businesses, and invite "famous" hot dog businesses from around the state, put them in one location, all working together to raise money for the children in our region under treatment for cancer and other life-threatening illness, through our treasured partnership with Hoops Family Children's Hospital at Cabell Huntington Hospital. We welcome you, your family, and the family dog, to come to our annual WV Hot Dog Festival to enjoy contests and competitions, live music and entertainment all day, displays, prizes, demonstrations, arts & crafts, great shopping, fresh farmer's market, car and truck shows, carnival rides, and to sample all of these wonderfully delicious hot dogs (as many as you can eat!) 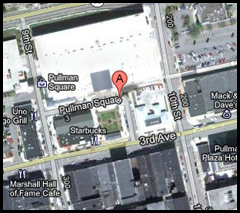 in one location for the entire day at beautiful Pullman Square, and 3rd Avenue, downtown Huntington. Come treat yourself (and your little dog too!) 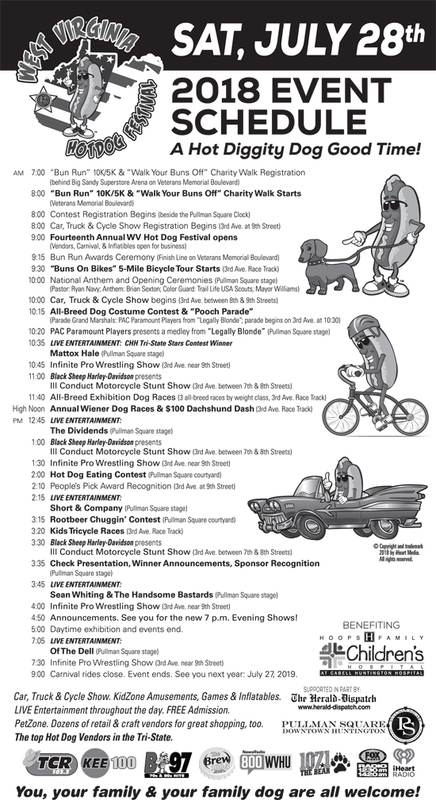 to our annual WV Hot Dog Festival (always the last Saturday in July each year)! July is national hot dog month, and it's a great way to celebrate this unique and delicious aspect of our Tri-State region! People who grew up in this area, but have moved away, are now planning mini-vacations and to visit family still in the region each July, so everyone can have a day at the WV Hot Dog Festival together…eating the hot dogs they so fondly remember, and sampling newcomers! There's something for everyone and every age: The annual Bun Run 10K & 5K (and 5K charity walk); Buns on Bikes (family bicycle tour of Huntington); All-breed dog costume contest & Pooch Parade; All-breed dog races (by weight class); the annual Wiener Dog Races at High Noon; Hot Dog Eating Contest; Root Beer Chuggin' Contest; Bun Fun Games for the kids and family; Classic & Custom Car & Truck Show; Inflatables for the kids; wrestling expo; Carnival Rides for all ages; and great LIVE ENTERTAINMENT all throughout the day! If you're from out of state, or out of region, YOU, too, are sure to find some great hot dogs you'll never forget! You'll have a wonderful time in our city, and loads of fun at our WV Hot Dog Festival! If you're a hot-dog lover….we happily roll out the red carpet to YOU…where have you been?! You'll have a ball! The West Virginia Hot Dog Festival name and concept, the logo, other artwork, and intellectual property are protected by trademark and copyright 2016 by iHeartMedia, Inc.